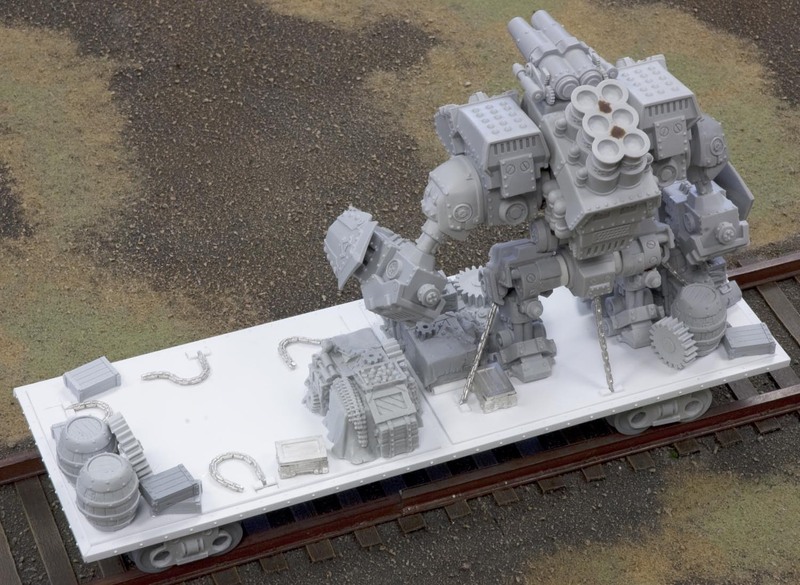 As we come into the final stretch leading up to AdeptiCon, what is a diorama involving a train heist without a train? The Trollbloods certainly picked the wrong train to hijack, as this one is packed full of Winter Guard escorting a pair of Conquests. Worse yet for the Trollblooods, with the train stopped on the tracks, the Khadoran forces can easily prep and deploy their colossals directly into the fray. The boxcar is admittedly somewhat plain. Essentially a box on wheels, the Khadoran military aesthetic is not known for ornamentation. Simple and reliable are the watchwords here, with exposed timber and riveted metal bracings being the primary aesthetic. 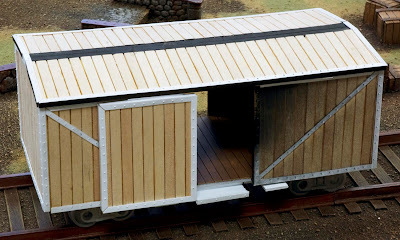 The boxcar was assembled and partially painted since the open doors allowed the interior to be seen. It is far easier to paint without the roof, rather than trying to squeeze a hand, brush, and paint through a tiny door. 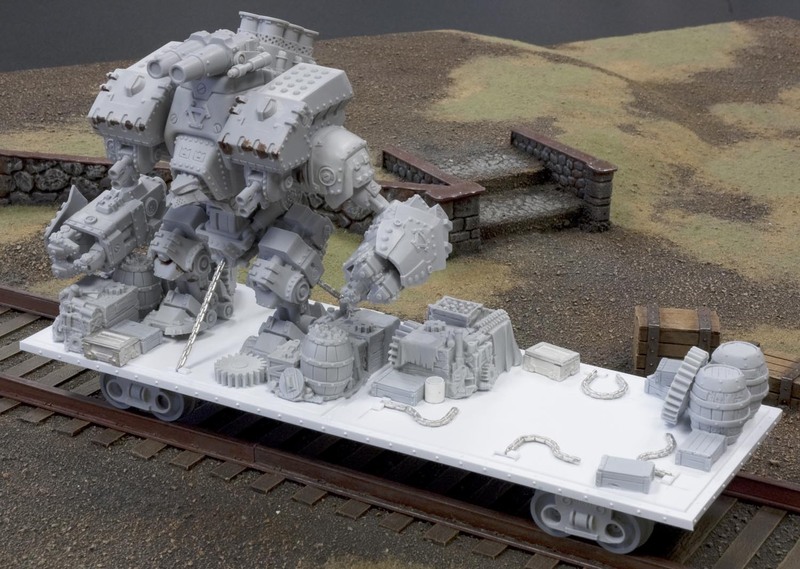 The transport flatbed holds the Conquest as well as stowed materials and tools needed on campaign. The stowed Conquest was converted into a neutral pose by taking an extra left leg and mixing pieces of a left and right leg to achieve a squatting position. The second Conquest has already been offloaded, leaving behind the chains used to secure the colossal as it is being transported. 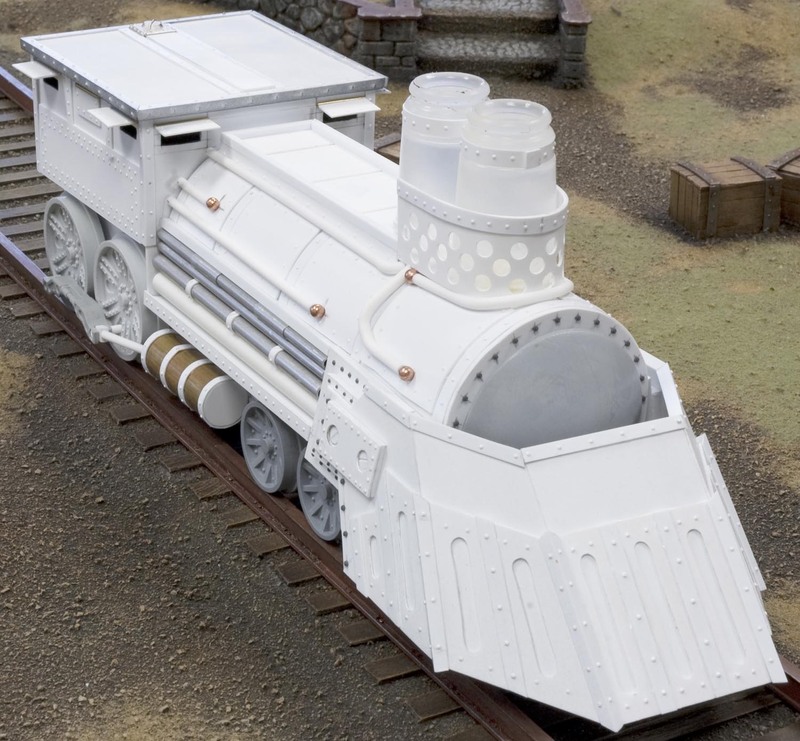 The train engine was envisioned as a hybrid of a real train and a Khadoran military bunker. 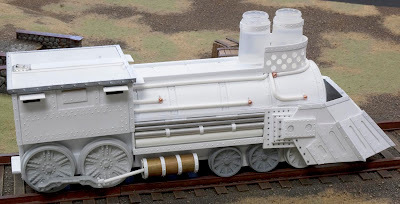 The boiler section was built around a 7” section of a tube leftover from a roll of vinyl, then skinned with thin plasticard to get the appearance of curved metal plates. The cow catcher (and by cow, we mean the pieces that used to be a cow) in the front was made with the scratch-builder’s two standbys: math and swearing. A paper version was made first as a proof of concept and as a way to visualize the angles and shapes. However, making sloped plates meet at angles with a consistent line at the top and bottom was far more maddening than initially realized. The engine was built primarily with various thicknesses of plasticard, cut, bent, and drilled into submission. However, a few parts were done with some shortcuts. Ben Misenar digitally designed the wheels in a mere fraction of the time it would take to do just one by hand. Once we had 3D prints of the wheels, it was a simple matter to make molds and cast as many wheels as needed for the project. The forward section of the boiler is a dose of resin poured into the bottom of a spray can, and the smokestacks are empty paint bottles. A few pieces of brass and aluminum tubing and some copper pellets completed the shopping list, and now we have a brand new train engine! This will be the last blog post concerning the diorama, so be sure to come by the Magnolia room at AdeptiCon to see the finished piece! WOW i wanna see this diorama ( but im in argentina ) y Hope to see a lot of Pictures..
All the world is specting the Mountain King TOO !